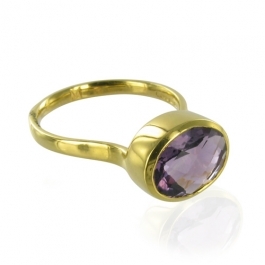 This amethyst designer stacking ring is certainly on-trend! From the Candy collection it's a beautiful hand cut oval gemstone set in 18k gold vermeil. Wear with other Candy stacking rings for a fashionable stacked look. Approx Stone size: 9mm by 12mm.